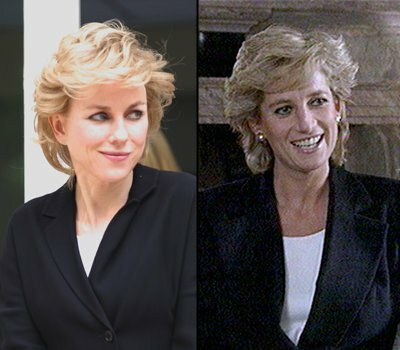 Film company Ecosse has released the first image of Naomi Watts playing Diana, Princess of Wales. British-born actress Naomi Watts is starring in a film that portrays the last two years of Princess Diana’s life. Principal photography started this week. The film is due out next year. Since being announced in February, the film has changed its name from Caught in Flight to the simpler Diana. Directed by Oliver Hirschbiegel of Downfall fame, it is believed to explore the princess’s relationship with the heart surgeon Hasnat Khan. Ecosse said the biopic “charts how finding true personal happiness allowed her to achieve her defining successes, as she evolved into a major international campaigner and humanitarian”. Dr. Hasnat Khan will be played by Naveen Andrews, from The Buddha of Suburbia and Lost, with other cast members including Douglas Hodge and Juliet Stevenson. It is rumored the film will also touch upon the princess’s relationship with Dodi Al Fayed, and her death following a Paris car crash. Ecosse directors Robert Bernstein and Douglas Rae have moved to quash any criticism of the film, saying that “everyone’s aim [was] to produce a truly insightful and compassionate study of Diana’s later years”. Naomi Watts, 43, rose to fame in Australian soap opera Home and Away before enjoying big-screen success in King Kong, 21 Grams and Mulholland Drive. Naomi Watts is six years older than Diana was when she died.